I thought that things like a massive roti full of chicken, bodi and pumpkin and so heavy you have to hold it with two hands was something that sits heavily in your stomach. I thought that a Sunday lunch, with a big piece of macaroni pie, stew chicken and callalloo chased with a cold beer was the type of thing to make you lie down and rub your bloated belly in contentment. I thought that spoiling yourself with a full — not a half — rack of ribs was one of those decadent indulgences that left you full and pleased (and maybe a little guilty). 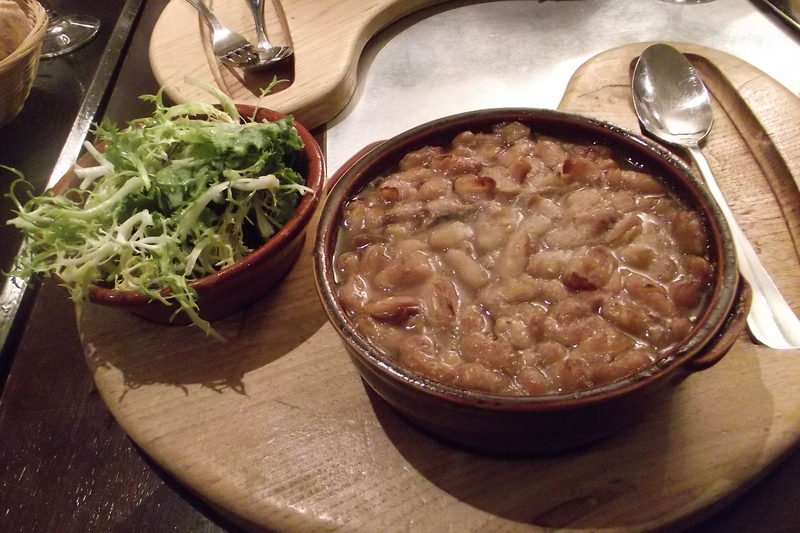 But I have never had anything as rich, and succulent, and sinful, and FILLING, as Toulouse’s famous dish, cassoulet! I know it doesn’t look like much — a clay pot full of beans? But don’t be fooled; this pot contains quite a mouthful. Mixed in with all those beans (haricot, by the way) is a Toulouse sausage, a huge chunk of salted pork with some pieces of pork fat thrown in, and a huge piece of duck. This slow-cooked stew tastes so amazing because it is full of, if I may be honest, really juicy fatty bits that stew everything together. Some versions also have liver or even fois gras. Amazingly, though cassoulet seems so decadent, it apparently has its roots in peasant cuisine where meat was never thrown away and everything has a use, especially in the winter. But I have to be honest; although it was absolutely delicious, as I ate it my stomach began scolding me after about five minutes. ‘What is this stuff? Whoa this is heavy stuff man! What is this? Sausage? AND duck? AND pork? Wait a minute, you don’t expect me to digest ALL of this food, do you? And fresh bread too, dipped in the gravy? Mercy! Mercy, I beg you!’ is what my stomach said, obviously dismayed at the mammoth task I had just presented it with. But, I ignored it, and carried on the best I could, though in the end I relented, and could not finish the dish. So, without a doubt cassoulet is amazing, and something to for sure try at least once in your life, especially if you are in Toulouse. Just don’t try to have it every day.